by a vote of 56% against it. (WNN) The proposal to force older nuclear power plants to close in Switzerland has been rejected in a referendum by a vote of 56% to 44% to retain the units. With 56% of people have voted ‘No’ to the rapid phase out, the election records a clear victory by winning both the popular vote and by taking majorities in the most cantons. Switzerland went to the polls on a further proposal that would have accelerated the retirements by forcing reactors to close at the age of 45. Because they are already over this age, Beznau 1 and 2 as well as Muehleberg would have closed in 2017. Gösgen would have followed in 2024, and Leibstadt in 2029. The five reactors that provide over one-third of electricity can continue to operate according to their economic lives. 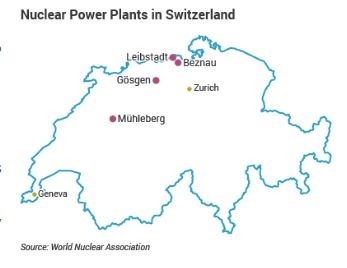 Nuclear power is Switzerland’s second largest source of electricity, providing about 35% of electricity in 2015 and complementing 52% hydro to give the country one of the cleanest and most secure electricity systems in the world.